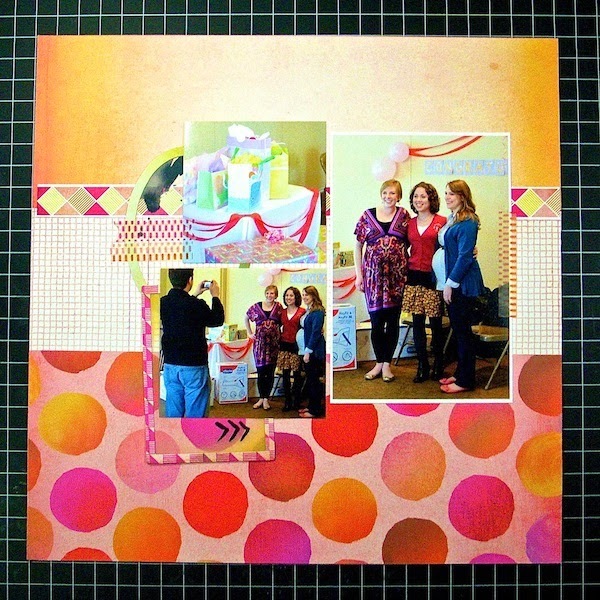 Have you ever started a scrapbook layout with patterned paper and color before photos and story? It's a great way to shake up your scrapping process. I had no idea where I was going when I assembled this background. I just had fun playing with the paper. Fun. Fun. Fun. 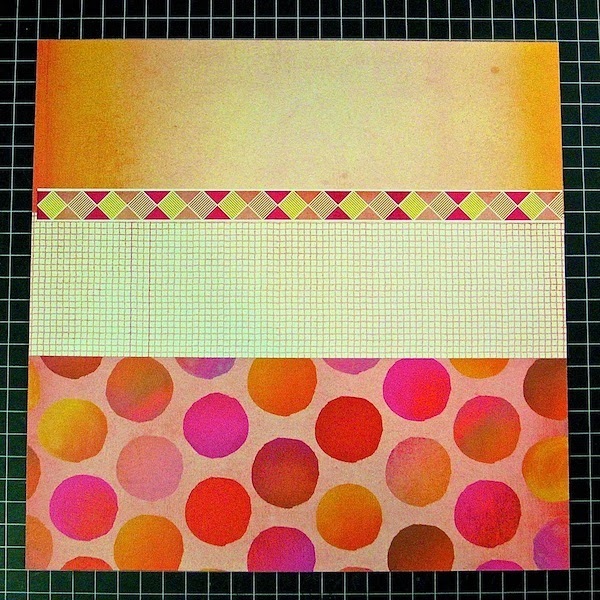 I started by piecing together a background of three large strips: a bold, playful polka dot on the bottom, a small grid in the middle and a tone-on-tone watercolor at the top. A warm color palette unites all three and a geometric border sticker completes the design. I feel like I just created a brand new piece of patterned paper! I chose pictures about a baby shower for our daughter in-law. The colors in the photos and the festive occasion were a good match for my background of color and pattern. The focal point photo is matted on white cardstock, while the smaller supporting photos are unmatted with additional layering behind them. Truthfully I usually start with photo, but there have been a few times where I just wanted to use some new or favorite papers and decided to just play with them. Lots of fun! I love how this turned out, and I love seeing a new blog post from you! I have tried doing this, but too often it sits unused. I need a bigger backlog of photos to scrap! Fun page! I have some of that collection. I love what you did with it. Like the flair in the middle.